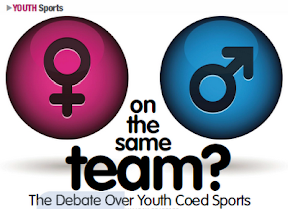 The March issue of Sports Events Magazine included an article on girls and boys playing sports together. Along with Nancy Hogshead-Makar (Women's Sports Foundation) and Nicole Lavoi, I was asked to contribute my thoughts on this issue. Some of my quotes reflect ideas that I've already discussed here. Others came from my answers to followup questions posed to me by Marcia Bradford, the article's author. Is Your Child's Youth Coach a Good Teacher? To Succeed in Team Sports, Keep Your Head Up!